Thailand’s gay magazine Thai Puan has published the March and April 2019 issue featuring Pool Boy model Jeff on the front cover. You can read issue 93 online here or at Thaipuan.com Free hard copies of this gay magazine can be found in most of Chiang Mai’s gay bars and venues. To see more pictures of handsome model Jeff pic up you copy of Thai Puan Gay Magazine. 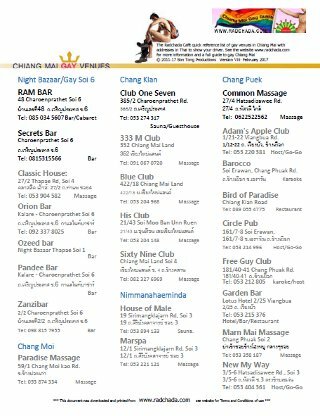 The magazine includes articles about Chiang Mai’s main gay cities, Bangkok, Pattaya, Phuket and Chiang Mai along with Maps and gay guides. This month David Edwards article about Chiang Mai is entitled “Gay Trip to Chiang Mai” and describes the essential tourist and gay places that may be of interest to visitors.